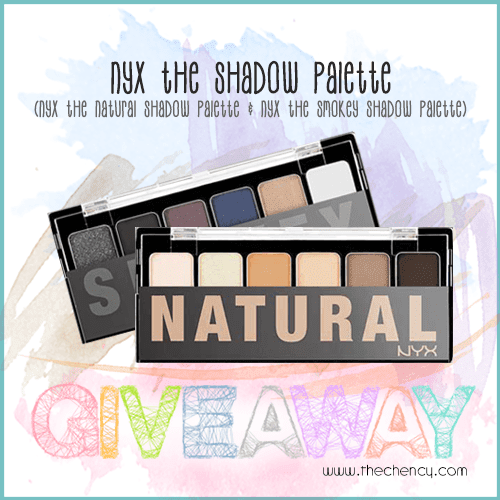 There is total 12 colours in both NYX The Natural shadow palette & NYX The Smokey Shadow Palete. Total colors for TWO NYX Shadow Palette is 6 colors. Wish can win the palette. There are 12 shadows in total in the two palettes. They are gorgeous too! For each palatte there are 6 colours so in total 12 beautiful amazing colours! Thx for all the giveaways! Each palette has 6 colours. With both the palettes, we get a total of 12 colours! There're 6 colours in each, total of 12 for two palettes!!! Thanks again for such awesome giveaway!